Until the company meets the target for this one debt metric, not much else matters for Sunoco. Sunoco (NYSE:SUN) is one of the more unique ways to invest in the oil and gas industry. As an owner of retail fueling stations and wholesale fuel marketing, it is in one of the most stable components of the oil and gas value chain. Based on the company's stock performance, though, it has been anything but stable over the past five years. Of all the ways that an investor could evaluate Sunoco, there is one metric that takes precedent over every other right now: leverage ratio. Here's a look at why this one metric matters so much for the company and why investors should pay attention. It doesn't take deep market research to realize that there aren't a lot of organic growth opportunities in the retail fuel-filling station market. Gas stations are pretty ubiquitous across the U.S., and so the room to organically grow is very constrained and mostly reliant on updating existing facilities. The only real way to grow substantially is through acquisitions. After all, the market for retail filling stations is very fragmented. Image source: Sunoco investor presentation. Sunoco tried to pursue this acquisition strategy. On top of the billions in asset drop-downs it received from its parent company, Energy Transfer Partners, it made several acquisitions in 2016 in excess of $300 million. Here's the problem, though. Sunoco's internal cash generation wasn't enough to support these purchases, and its stock price was so low it was prohibitively expensive to issue shares. As a result, it pulled out the credit card to fund these purchases, and loaded up its balance sheet with a great big pile of debt. SUN Total Long Term Debt (Quarterly) data by YCharts. There are also some other restrictions related to senior secured-level debt and interest-coverage ratios, but if it can meet those leverage ratio targets, then the restrictions fall away. This debt-reduction schedule is going to dictate just about everything that the company does over the next two years. We already have seen the company's distribution growth come to a grinding halt, and management just announced a plan last week to pursue "strategic alternatives" -- in other words, a sell-off -- for more than 100 of its undeveloped real estate assets. Those tracts of undeveloped land were supposed to be the company's organic growth opportunities for the next several years, but that opportunity is going to get killed by the company's current need for cash. This goes to show how important this metric is for the company's future. Any investor looking at buying or owning this stock over the next couple of years needs to know that there won't be much in terms of payout or organic growth until this issue gets addressed. Sunoco would appear to be a worthwhile investment for those seeing a stable business that generates consistent cash flow. Unfortunately, management's desire to grow quickly has painted it into a corner debt-wise that will make even modest growth hard to achieve in the coming years. 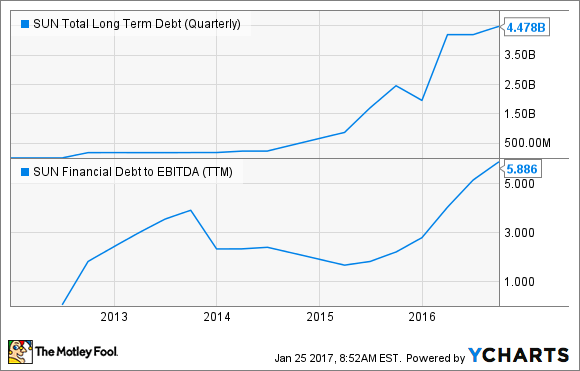 Perhaps when Sunoco's creditors take off the debt-level training wheels in a couple of years, it will be a stock worth revisiting. Until then, though, the company will likely be in neutral and you won't be missing out on much.